these summaries represent the GIMBLETT GRAVELS WINE GROWING DISTRICT as a whole and therefore do not specifically reflect the experiences of individual member producers and their vineyards. Another great harvest on the back of two exceptional vintages. Flowering was delayed for Merlot and Syrah due to a cool spring, with North West winds. A dry summer followed, with typically good temperatures through to the New Year, and then a very dry January and February with heat summation running similar to the classic 2013 season, allowing the red varieties to be on track for typical harvest dates. Cyclone Pam’s arrival in March threatened to affect the vineyards, however with only the tail end reaching the Gimblett Gravels Wine Growing District and the later season, the grapes were not yet ripe enough to be damaged, with cool southerly winds drying the vineyards out immediately after the rain. 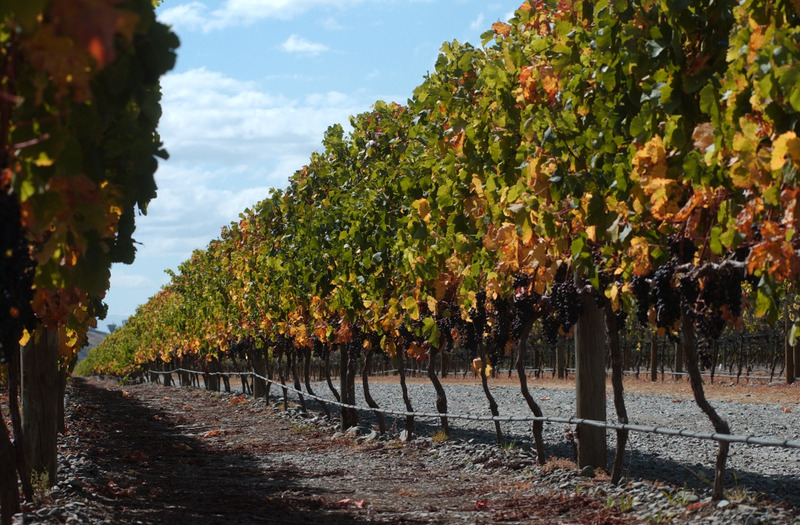 The mostly dry summer, coupled with little frost, resulted in excellent growing conditions in the Gimblett Gravels Wine Growing District, with harvest beginning under sunny skies. A short bout of rain around the 10th April, followed by very cool dry weather, minimised any negative effects, with settled weather then occurring right up until the end of harvest. Another strong Syrah vintage, along with impressive Merlot and Cabernet Franc. Looks like a hat-rick for the Gimblett Gravels Wine Growing District, with 2015 another very good harvest, following the exceptional 2013 and 2014 vintages. For the second year running Mother Nature served up a superb season in the Gimblett Gravels Wine Growing District. 2014 promises to be an extremely strong vintage for the Bordeaux varieties and Syrah. A very mild spring and summer in the Gimblett Gravels Wine Growing District, with consistently warm (but not extreme) day and night temperatures, led to an advanced season from budburst onwards. Total Growing Degree Days were at record highs and were well ahead of the very warm 2009 and 2013 seasons. The end of the season remained dry and warm until the 5th of April, with significant rainfall occurring in the 10 days following. The main ripening period for 2014 was similar to 2013, in that it was dry with the vines refreshed by small incidences of rain at just the right times. The beginning of the season was frost free and mild with good soil moisture levels. Ideal conditions at flowering meant excellent bunch weights and numbers resulting in vineyards delivering good volumes of sensational fruit. A settled autumn ensued ideal ripening conditions, resulting in an earlier, compressed vintage, with most growers finishing harvest about two weeks earlier than usual, in mid-April. Vintage 2013 will go down in history as one of GIMBLETT GRAVELS’ greatest ever years, that is for certain. Talk to anyone you know in Hawke’s Bay, and they will tell you it was “the summer of your childhood”. After a damp 2012 winter there was a fall off of rainfall into the spring. Early spring temperatures were average and so bud break started at the normal time in mid to late September. The weather warmed nicely into October although there were several frost events and many occasions that wind machines and helicopters were deployed. From mid November, temperatures progressively became warmer and by late December they were approaching the mid thirties in the vineyards on a day to day basis. This set up a very good flowering and fruit set. From December 21st till 2nd January there was a very warm period with warm days and unusually warm nights with temperatures hardly ever dipping below 18 degrees. Between the 9th and 15th of January there was a spell of real heat with vineyard temperatures typically peaking in the mid thirties during the day and on two days approaching 40 degrees. This was followed by a remarkable run of anticyclonic weather patterns with fine calm days, cool nights and little wind and rainfall. Lasting from 20th January till the 4th of April, this stretch of 70 days of fine weather coincided with the veraison right through to maturity in most varieties. It would be hard to imagine a better spell of weather in which to ripen grapes and in particular Cabernet, Merlot and Syrah. The 4th till the 7th of April were cooler but then more fine days followed till the 16th of April to complete the ripening of the Cabernet and Syrah. Most blocks of these later ripening varieties were harvested before rain arrived on the 16th of April. Compared to the long term average of 350 mm, September to April rainfall was just 130 mm. One surprising aspect of the vintage was that the Brix levels of the fruit at maturity were lower than would normally be expected. As a result, most wines will be typically under 14% alcohol yet still show superbly ripe aromas and tannins. Merlot – This variety will vie as the most successful variety of the vintage. There is a fantastic aromatic purity in the wines without the sometimes jammy characters that can mark this variety if hung out too long. The tannins are very polished. Syrah – the aromas appear as being very floral and pure. Again, the tannins are superb, and the finish is elegant without any sense of heaviness or overipeness. Cabernets Franc & Sauvignon – here we have some simply incredible wines. Cabernet Franc that is pure violets and sweet black fruits, lush and rich, and Cabernet Sauvignon that sings with intensity and aromatic complexity, along with fine and prestigious tannins. Blended with the amazing Merlot’s these will make some truly memorable wines that should cellar well for decades. In summary, 2013 vintage GIMBLETT GRAVELS reds will be talked about for decades. This is a vintage for the cellar, for the desert island, and for all our pleasure! 2012 provided a very long growing season that was challenging but also surprising. Characterized by a cool spring to start with, vines set small crops as the cooler weather extended through flowering. Even though spring was cool there were relatively few frost events which meant that vine growth progressed steadily into summer. The usual hot Hawke’s Bay summer didn’t eventuate, although it was fairly dry with cool to mild temperatures experienced across the region. As a result, the season was significantly delayed. Veraison occurred later than usual and harvest didn’t commence until well into late March. With the uncustomary late start a lot of harvest decisions were based on fruit flavour as flavour peaked well before usual targeted sugar ripeness levels were achieved. With the onset of autumn rain small windows of opportunity were needed to be taken to get fruit into the winery in good condition. Thankfully, a warm dry spell finally came after Easter which gave about 20 dry days through to the end of April. Fruit still on the vine had the opportunity to fully complete flavour development. Merlot – the longer growing period created physiological ripeness but at lower sugar levels. Wines will show elegance and balance at slightly lower alcohol levels. Syrah – Syrah continues to impress with its versatility to our conditions. Very attractive flavours are showing with heightened florals and purity of fruit portrayed. Later harvested blocks produced some very ripe fruit. Cabernet Sauvignon – being such a late variety benefited from the late dry and warm spell in the latter part of April. This, along with the tiny crops, resulted in some very good quality Cabernet Sauvignon being harvested. In summary, the 2012 vintage has been a pleasant surprise, given the challenges of a longer, cooler, growing season and unsettled weather conditions around harvest. The hallmark vibrant colours and flavour in all of the red varieties remains, along with good tannins, albeit a little lower than normal. We can look forward to more medium bodied wines enjoyable over the short to medium term. In the 2011 season the heat summation was actually better in the summer months (Dec – Feb) than in 2007 and 2009 on the Gravels. It was the warmest summer since 2005. December was warmer than normal and the warm weather continued through January until the 18th of the month when there was a 5 day period with rain. On the 24th of Jan it fined up again and there followed a very warm dry period of 14 days. This was one of the hottest spells of weather experienced in Hawke’s Bay that threatened to rival the heat of February 1998. Unfortunately the weather became cooler from mid February on. It was more in line with seasonable averages. There followed periods of rain through March and April to the harvest and beyond. Because the Gravels are so well drained they coped well with the wetter than usual summer and autumn. The fruit really benefited from the warmth of Jan and Feb. The sugar levels in the fruit were lower than normal due to the wetter autumn but there are no signs of unripeness in the resultant wines. The wines are expressing very pure and ripe berry aromas. The Merlot and Syrah have lower tannin than is usual. They are lighter in body but have a very nice freshness and acidity. The tannins are ripe. The Cabernet’s have more tannin and concentration and are surprisingly big. Again, the tannins seem ripe. In summary, the vintage will produce soft, lighter styles that will be attractive sooner than in normal vintages. We may be surprised with the longevity of the wines. The tannin ripeness may prove to be their strength especially for the wines that came from fruit that better weathered the wetter periods. The 2010 season could be described as a season of two halves. The growing season began in September with good shoot growth and development. A few spring frosts were encountered but comfortably negotiated without significant impact. Some cool weather was experienced over the flowering period which affected the fruit set across most varieties. This resulted in berry numbers per bunch being lower than previous seasons; consequently, the yield potential was restricted from this point on. Throughout the growing season the bunches remained open due to the low berry numbers and thus crop loads were lighter than usual. Fruit thinning was still required on some blocks but, on the whole, reduced due to the light weight of the bunches. The summer months (January, February) could be described as mild. There were few days that reached over 30Celsius which slowed the development phase of the fruit. This resulted in veraison being later than usual, the main colour change not occurring until early Autumn. Autumn was a completely different proposition and can only be described as fantastic! Warm, dry and settled conditions helped to really accelerate the ripening phase and the fruit started to make up for the summer it didn’t really have. The weather was so fine and settled that harvest could commence at a slow but steady pace. Winemakers’ spirits rose in the confidence that an ‘Indian summer’ had started to unfold. Chardonnay benefited from a long maturation period and was harvested later than usual but in perfect condition. Ripe, clean flavours with balancing fresh acidity are the key attributes for this variety in 2010. By the end of March, Merlot and Cabernet Franc tasted ripe and fruit was very clean due to the continual warm conditions. Winemakers continued to hang fruit on the vine in search for additional flavour development and tannin maturity. The majority of fruit wasn’t harvested until well into April, the result being very pure and distinctive expression of these varietals. Syrah continued to impress. There were some concerns about how this variety might perform with a cooler summer but all doubts were firmly allayed. With the settled autumn conditions Syrah performed to a very high standard and will, without doubt, produce some of the most exciting wines coming out of the GIMBLETT GRAVELS WINE GROWING DISTRICT from the 2010 vintage. Cabernet Sauvignon was a challenge but well set up and managed vineyards still produced very good quality. In summary, the 2010 vintage saved the very best until the last. The “Indian summer’ experienced highlighted the value of settled weather over the vintage period. There is no doubt that 2010 will produce some of the most interesting GIMBLETT GRAVELS wines yet. Vintage 2009 In the GIMBLETT GRAVELS WINE GROWING DISTRICT will be one to remember for red grape varieties and is expected to create some of the best ever wines to date. While the season started with a few frost events during spring, the growing season through to veraison was dry and warm, perfect for wine growing. With very warm December conditions we experienced a very quick, even, flowering which resulted in great conditions for fruit set. January brought warm, dry conditions (20 degree celcius average) which helped keep berry size small. These conditions pushed all varieties through to bunch closure and veraison very quickly setting the season up to potentially be “the perfect vintage”. Early February brought about more dry settled weather which further accelerated ripening, but in late February we had a significant wet weather event (50mm) that put botrytis pressure on some of the early white varieties. Due to the perfect December/January conditions fruit for the red varieties was truly ripe. Intense flavor had developed, tannins had developed nicely, seeds were ripe brown in colour and vines were in good balance, all of which signals the potential for phenomenal wine production. Certainly the Bordeaux blends and single Bordeaux varietals produced from 2009 will be some of the best yet produced from the GIMBLETT GRAVELS WINE GROWING DISTRICT. Syrah benefitted from a longer than usual ripening period and as a result the flavours in the berries were very intense, delivering the potential for outstanding wines from this vintage.